Celebrate Travel Nurses Day 2017! Calling all travel nurses: Travel Nurses Day is Friday, October 13th! Everywhere you look, there are pumpkin spice lattes, leather boots, and a colorful pageant of vibrant leaves. It must be fall. For travel nurses, the fall season also means a special holiday, Travel Nurses Day, is near. Created by Medical Solutions, Travel Nurses Day celebrates the hardworking spirit of travel nurses everywhere. This Friday, October 13th is your chance to treat yourself and celebrate your travel nursing career. Over at Medical Solutions, they’ve started the festivities early. Starting today, you can play games, enter contests, listen to music, and win PRIZES all week long! 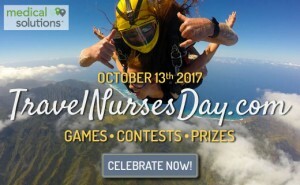 You can visit TravelNursesDay.com anytime starting now until midnight, central standard time on Oct. 15, 2017. Prize winners will be announced the following week. This entry was posted in Travel Nursing and tagged featured, travel nursing, travel nursing central by TNC. Bookmark the permalink. It is also medical assistant month too! Happy travel nurses day!